Well I guess the title says it all. Today I will be writing to you about M. Night Shymalan’s new movie ‘The Last Airbender’. I watched this movie yesterday and frankly… it was one hell of a disappointment. It is definitely somewhere at the top of my ‘worst movie ever’ top 10. In this review I will not give a plot summary (since you can find those everywhere on the net), but I will discuss the casting, setting, acting etc. Seeing that the movie is based on the Avatar series, I had expected that the actors would have been casted to fit the profile of the characters in the series… I could not have been more wrong. The only character that actually looks like the character in the series is Aang. Where as in the series most of the other characters are either Chinese, Japanese, Mongolian etc. (and thus coloured), here most of the characters are white. 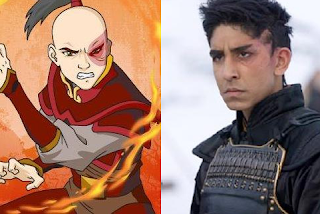 The exceptions are Prince Zuko, Commander Zhao and Fire Lord Ozai… which for some reason are all Indian (don’t ask). Also Zuko’s Uncle Iroh is no longer the fattish, old Chinese man, but has suddenly also become white and has lost quite a few kilo’s. If the director made these changes in the characters on purpose in order to distance himself from the cartoon series, I do not know. If we look at it in this light, it would then make sense that he tried to change the actual character (rather than just appearance) of some of the characters. 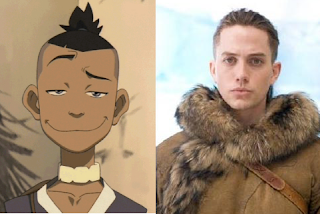 For example, Sokka is now no longer a boy who is a little clumsy and constantly makes stupid jokes, but is now a boy on a voyage to manhood who actually looks like he is rather capable and has lost his sense of humor all together. However, by just changing the character of one protagonist, this does not work at all. Katara is still the motherly type (or at least… this is what becomes clear from the dialogue), that looks after Aang; Aang is still the boy who struggles to come to terms with being the Avatar (or at least… the story tells us this); and Zuko, other than suddenly having become Indian and losing his long hair, is really just the ‘proud and seeking for revenge’ Zuko that we know from the series. So if this is in fact what the director was trying to do, then he failed in his purpose. Zuko (... I really don't see the resemblance). I could very well have forgiven the director the miscasting when it came to ‘looks’, but I cannot forgive him for the miscasting when it comes to acting. Most characters in this movie just can’t act. Katara’s acting is stoic and incredibly unconvincing. 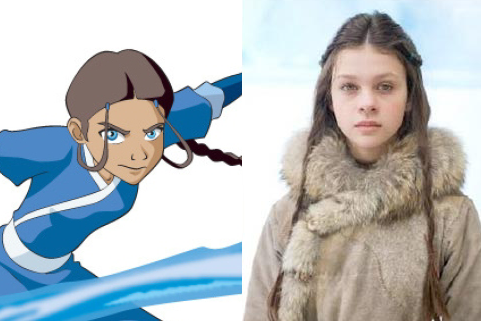 Whilst the Katara in the series is rather like a ‘powerhouse of a girl’ with heaps of gumption and how constantly shows her concern and care for others, the girl that is playing Katara in the movie, Nicola Peltz, does not succeed in showing these characteristics. When she is supposed to be motherly and concerned she looks indifferent. When she is supposed to look strong and brave, she looks weak, fragile and at times even a little frightened. In other words, it seems as though this girl does not understand Katara’s character at all. Worst of all is that she speaks her part as if she was reciting it, rather than saying it in a natural way. The same is true for Sokka; the way he says his lines is especially in the beginning rather static. Although his acting at first is rather stiff, he seems to warm up to his part during the movies. However, at that time his acting still comes across as amateuristic. 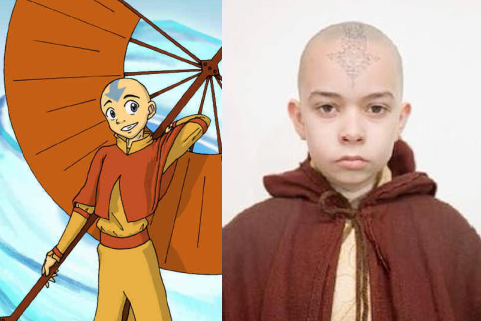 Also the actor that plays Aang, Noah Ringer, has not succeeded in doing a proper job. Even thought his story is about Aang who needs to come to terms with him being the Avatar, we do not see Aang’s fears and doubts reflected in Ringer’s acting. Rather, Ringer seems to portray an Aang who was already accepted that he IS the Avatar and is ready to become a leader. This Aang comes across as far too mature. It may be that this was not Ringer’s own choice, but rather a choice of the director. Be this as it may, it may be clear that in either case the director did not understand Aang’s character at all. One of the reasons that Aang ran away is that he wants to be a normal boy, to have a family and basically just lead a normal life. He wants to play, just like other kids, but because he is chosen to be the Avatar, he will never be able to do so. As a result the Aang in the tv-series often makes jokes and actually often just plays around. The Aang in the movie, however, often frowns, is grave all the time and does not have a sense of humor. The maturity and graveness of this character stands in the way of portraying Aang as he really is: a scared young boy. As such the dialogue focusing on Aang being afraid comes across as unnatural and fake. So the movie was no good when it came to typecasting or acting. So, how about the visual effects? Well, these weren’t really something to write home about either. Sometimes they looked too much like it was computer animated to come across as real. Also, the speed with which the benders attacked was far the slow. Before Aang or Katara were finally ready to actually shoot water or wind at an enemy, the enemy could have already just plunged a fist in their face or a sword between their ribs. Because of this the action scenes looked rather slow and unrealistic; it would have been far better if they had ‘sped up’ the scenes a little. … Did the movie have any good points? Well, the only thing I can really praise this movie for was the set. The movie sets really are incredible for the movie. Especially the city of the Northern Water tribe was just breath taking. Here they really paid close attention to what it looked like in the anime and did their best to reconstruct it, without having it come across as fake. They really, really did a good job on this. Also the costumes really do look like the ones that are used in the series. So two big thumbs up for the crew. Well, really that is all there is to praise this movie for. So my advice: save yourself time and money and do NOT go see this. If you have time on your hands, just (re)watch the series instead. It will give you a lot more satisfaction. I regret it watching it, because it left me completely disappointed. Ya know, I haven't really watched the animated series so when I went to watch it (with my mommy too) it wasn't half bad. However I have heard same sentiment being expressed by a lot of other fans of this animated series.